I’m easily confused, so I was befuddled by these two books with slightly different covers and titles but identical descriptions. One title is longer, one title is all in lower case… what was going on? I’ll break it down for you: it’s the same book, The Time-Traveling Fashionista (On Board the Titanic), Bianca Turetsky, (2011, 262 pages.) 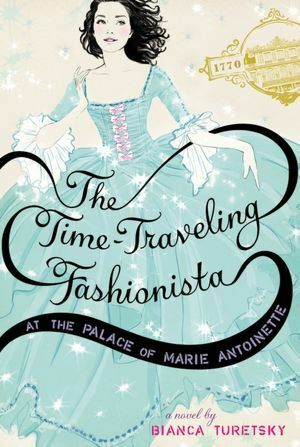 Ms. Turetsky wrote a second book, The Time-Traveling Fashionista at the Palace of Marie Antionette, which also has a similar image, but in blue. Are we straight now? The author is an artist and lover of vintage clothes, and the most unique aspect about these books is that they have several full color, full page illustrations, most of fancy dresses. In The Time-Travelling Fashionista, 12-year-old Louise Lambert lives in the past somewhat. She prefers movies and clothing from earlier decades. One day, out of the blue, she receives an invitation to a vintage clothing sale. Just the place to get a dress for the upcoming seventh grade dance, she thinks, as she heads out to the address on the card. She finds it a little odd that the fashion sale is in a nondescript house, and she finds the two women running the sale odder still, but she is dazzled by the charming vintage pieces. She is drawn to a gorgeous pink dress. She tries it on and everything goes black. When she wakes up, she is on board a fancy ship. Everyone is calling her Alice Baxter. She has taken over the body and assumed the life of a fancy movie star! At first it’s a dream come true: she has a wardrobe full of amazing dresses, her own maid, and a dashing guy even seems interested in her. Of course, someone else’s life is never as perfect as one might imagine. Oh, and then someone mentions they’re on the Titanic. WHAAAT!? This story had enough suspense to keep it interesting, although I was not on the edge of my seat. My favorite aspect of the book is the friendship Louise develops with her maid, Anna. Louise shares with Anna that she has traveled through time and is not the real Alice Baxter. The author sort of touches on the fact that times have changed in the past hundred years, and whereas it would not have been likely that a movie star would have been friends with her maid in 1912, in modern times this is possible. This book is technically YA, although in my opinion it does not have content that would make it unsuitable for younger readers. There may be some confusion about its classification however, as this book was in the YA section of the library, but its sequel was in youth fiction. This is definitely a book for girls, I can’t imagine a boy or even a tomboy being interested in this book. This post represents a turning point for my blog. I’m crying uncle, I’m throwing in the towel, use whatever cliche you want: I’m giving up on restricting my reviews to middle-grade books. I just can’t find enough middle grade time travel books that I want to read. So now I will also review YA time travel books. I’m excited about the opportunities for fun reading this will afford me. However, my feelings are a little mixed. Young Adult books get so much attention, so I felt good about having a blog that gave only middle-grade books a place to shine. But I’m looking forward to this new phase, and committed to keeping the reviews about time travel stories coming! This entry was posted in Book reviews and tagged Book reviews, kids' time travel stories, The Time-Traveling Fashionista, Titanic, YA Fiction. Bookmark the permalink.